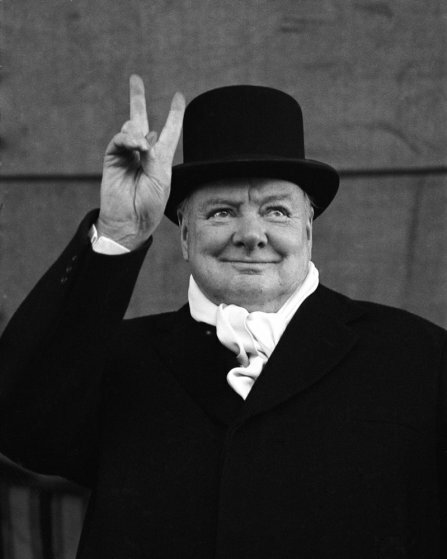 British PM Winston Churchill sporting top hat with coat and scarf as he holds up veed fingers. In its immediate aftermath it was difficult to measure the colossal extent of what had happened. Only one clear and unambiguous good was at once visible, the overthrow of the Nazi regime, and the delivery of Europe from an appalling terror. No regime so systematically vile had ever before dominated so much of the civilized world. As the Allied armies advanced into Europe, the deepest evils of a system of terror and torture were revealed by the opening of the prison camps and the revelations of what went on in them. It was suddenly apparent that Churchill had spoken to no more than the bare truth when he told his countrymen in 1940 that ‘if we fail, then the whole world, including the United States, including all that we have known and cared for, will sink into the abyss of a new Dark Age made more sinister, and perhaps more protracted, by the lights of perverted science’. The reality of this danger could be seen at once at Bergen-Belsen and Buchenwald, the sites of the first two camps of victims of the regime to provide horrifying films of the Nazis’ treatment of their prisoners. They were soon being shown in the cinemas of the victors, and awoke strong feelings against Germans. As more horrors were uncovered, distinctions ceased to be meaningful between the degrees of cruelty inflicted on political prisoners, on slave labourers from other countries (of whom millions had been brought to work in German factories or on military construction projects like the ‘West Wall’ fortification of the French coast), or on some of Germany’s prisoners of war. Even all these, though, were eclipsed as the evidence became available of a systematic Nazi attempt to wipe out European Jewry in a so-called ‘Final Solution’ of an irrational problem: the pursuit of racial purity. The ultimate origins of what came to be called the ‘Holocaust’ lay back well before 1901, in deep-rooted antisemitism, crackpot theories about international Jewish conspiracy, mistaken eugenic ideas. After 1933, inadequate men and women and even psychopaths were easily found to be enlisted for official persecution of the Jews, a sinister enough piece of evidence about Nazi society, but many ordinary Germans were, sometimes from fear, sometimes from indifference, also willing to go along passively with what they knew and saw of persecution and, later, of extermination policy. The notion that Germany might actually itself be cleansed of Jews had surfaced (in the offices of the Nazi security service) as a practical proposition as early as 1934, but the exact process by which it developed into a scheme for total extermination was complicated, cloaked in secrecy, and is still debated. In it, the Nazi élite, the SS organization, played a major part. The outcome was a transformation of the demographic map. Overall, though complete figures may never be available, it is probable that between 5 and 6 million Jews were killed, whether in the gas-chambers and crematoria of the extermination camps, by shootings and extermination on the spot in east and south-east Europe, or by overwork and hunger. Polish Jews were almost wiped out, and Dutch Jews, too, suffered terribly in proportion to their numbers. But distinctions at such a level of atrocity hardly mean much. No nation had engaged in the war because it saw it as a struggle against such wickedness, though no doubt many people were heartened as it went on by the sense (assisted by intelligent propaganda) that the conflict had a moral dimension. Even while Great Britain was the only nation in Europe still on her feet and fighting for her survival, many of her people had sought and had begun to see in the struggle positive ends going beyond mere survival and even beyond the destruction of Nazism. Hopes of a new world of good relations between great powers and of social and economic reconstruction were embodied in the Atlantic Charter and the organization of the United Nations for peaceful cooperation. They were encouraged by sentimental but wholly understandable goodwill and gratitude towards allies and a tragic blurring of differences of interest and social ideals that would re-emerge only too quickly when fighting ended. Much wartime rhetoric then boomeranged badly; disillusionment often followed inspection of the world soon after the guns were silent. Yet for all this, the war of 1939–45 in Europe remains a moral struggle in a way, perhaps, in which no other great war has ever been and without any of the combatant governments intending it to be when they entered it (except, pervertedly, the German). It is important never to forget this. Too much has been heard of the regrettable consequences of Allied victory; it also brought to an end the worst challenge to liberal civilization and human goodness that has ever arisen. There was a deep irony in that. Germany had for so long been one of the most progressive countries in Europe, the embodiment of much that was best in its culture. Germany was a major contributor to the civilization which had gone round and, indeed, had made, the modern world. That she should fall prey to collective derangement on the scale implied by the Holocaust (to say nothing of other atrocities) suggested something rotten at the root of that civilization itself. The crimes of Nazism had been carried out not in a fit of barbaric intoxication with conquest, but in a systematic, scientific, controlled, bureaucratic (though often inefficient) way about which there was little that was irrational except the appalling end that it sought and the lunatic mythologies which fed it. In this respect the Asian war was different, for all its brutalities. Japanese imperialism replaced the old western imperialisms for a time, but the subject peoples did not always wholly regret the change, even if they were often ruthlessly exploited and cruelly treated. Allied propaganda during the war attempted to give currency to the notion of a ‘fascist’ Japan, but this was a distortion of so traditional a society’s character. When all the atrocities of Japanese occupation have been weighed, it remains hard to believe that such appalling consequences as faced European nations under German rule were in Asia bound to follow a Japanese victory. Glib comparisons are, of course, useless and perhaps dangerous. When we say that Nazi behaviour in Europe and the Holocaust were ‘worse’ than earlier atrocities, and that therefore the men who carried them out were ‘worse’ than the villains of the past, we speak truly, but must be clear about what that means. It is not just a matter of the scale and intensity of brutality and destructiveness made possible by the capacities of industrial societies. Great atrocities have taken place in the past whose precise extent we can never measure, and the subjective and relative impact of which we cannot imagine, because the mental and cultural context is so hard to understand. Doubtless, too, innumerable acts of appalling cruelty have been lost in oblivion. The most exquisite deliberate tortures, physical and mental, have been inflicted by human beings on one another (and were repeated between 1939 and 1945; many who did not themselves suffer in the evil of the Holocaust died under them). Terrible things, too, would be done after 1945. The overall record of the Nazis, nonetheless, strikes us still as uniquely dreadful because its perpetrators had no excuse for not knowing better. The torturers and exterminators were born of cultures that had centuries of moral reflexion and argument behind them, all the progressive thought of the last three centuries of European civilization, all the slowly refined, humanized teaching of Christianity. They had no excuse of ignorance or tradition. They had deliberately turned their back on the good. Distinctions can of course be made among villains and certainly between perpetrators of brutal acts of war. There is a line that can be drawn between the evil and perverted Hitler and the bombastic, bullying but less corrupted Mussolini, between the doctrinal, lunatic cruelty of the SS and the often revengeful, embittered but still rationally defensible planners of the Allied strategic bombing offensive. However it felt to be its victim, there is a distinction to be drawn between Nazi tyranny and the fanatical, devoted ruthlessness of the Japanese, or even between Nazism and the brutal defensiveness expressed in Stalin’s near-paranoia with possible opposition. It was above all in Germany that the twentieth century revealed itself as an age when men in power in a civilized country deliberately chose to turn their backs on civilization. The most immediately obvious further result of the war was its unprecedented physical destructiveness. Hiroshima and Nagasaki, the first victims of nuclear warfare, were not, in fact, the best evidence of this. It was most visible in the German and Japanese cities devastated by bombing. One of the major features of the Second World War, this proved much more costly to life and buildings than had been the bombing of Spanish cities in the Spanish Civil War (though those early essays in terror had been enough in their day to convince many observers that bombing alone could bring a country to its knees). In its effects, although bombing was often invaluable in combination with other forms of fighting, the huge strategic offensive against Germany built up by the British Royal Air Force from tiny beginnings in 1940, and steadily supplemented by the United States Air Force from 1942 onwards up to the point at which their combined forces could provide a target with continuous day and night bombing, achieved very little of decisive importance until the last few months of the war. Nor was the fiery destruction of Japan’s cities strategically so important as the elimination of her sea power. The cost of victory in lives had been very great. The numbers will never be exactly known; it seems as if more than 50 million people must have perished round the world in military and naval operations. Battle casualties, above all on the eastern European fronts, far surpassed those of the Great War; Germany suffered more dead than in 1914 – 18 (about 3 million on the eastern front alone) and Russia the staggering possible loss of more than 20 million people, though not all on the battlefield. About half that number of Chinese, military and civilians together, died in all. Famine and disease helped to send up the overall total even as the fighting was drawing to a close – in Greece, for example – and in India a great famine in 1942 had carried off 2 million dead. As for individual acts of violence, bombing had killed hundreds of thousands of Germans and Japanese, while the deaths at Hiroshima and Nagasaki showed that similar holocausts could be even more easily achieved by the enormous power of nuclear weapons, of which those used in 1945 were only early and relatively feeble examples. It was probably true that no one before 1939, however fearful of war, would have guessed that human society could endure such bloodshed and survive.